﻿The portico from El Conquistador Hotel is part of the gatehouse at the Sin Vacas subdivision. Kelley Rollings at Camino Sin Vacas and Calle Sin Pecado in 2013. Some street names resemble the Seven Deadly Sins. A subdivision just north of Ina Road and west of Campbell Avenue has many street names that sound a lot like the seven deadly sins. One-time property owner William J. “Jack” Holliday was born in Indianapolis in 1895 to Jacquelin and Florence (Baker) Holliday. He graduated from Yale University in 1917, then spent 40 years in the steel business in Indiana. Holliday was an avid collector of books and photos of the Southwest and donated more than 6,000 volumes of history, including many rare books, to the Arizona Historical Society. He died in 1977, and a portrait of him hangs on the wall in the reception area of the Arizona Historical Society. 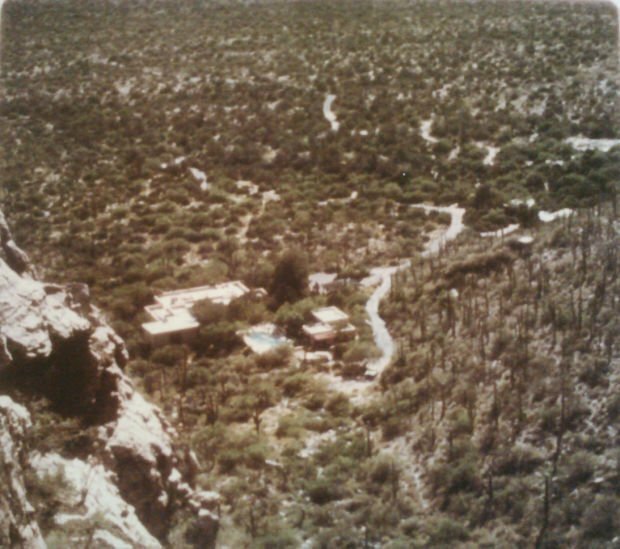 In the 1930s, Holliday bought land from Pima Canyon Properties to use as his residence during winter. It is believed that he fenced the land and named it Rancho Sin Vacas — Ranch Without Cows. Holliday was fond of desert wildlife. He put water troughs throughout his property and made Rancho Sin Vacas a sanctuary-like area. To reach it, he used a dirt airstrip that is now part of Calle Sin Controversia — Street Without Controversy. Rancho Sin Vacas was acquired by auto dealer and developer Kelley Rollings in 1967. It was Rollings and Catalina (Salgado) Randall, his Spanish-speaking office manager, who gave the streets their unique names, such as Calle Sin Envidia (Street Without Envy) and Calle Sin Desengano (Street Without Disappointment). The street names had a loose connection with the Seven Deadly Sins. The following year, Bill Deyoe, a contractor tearing down midtown's old El Conquistador Hotel, sold Rollings the portico of the hotel for approximately $1,000. Rollings kept it in storage for more than 10 years, before giving it to the Sin Vacas subdivision, where it is now part of the gatehouse. Plaza Sin Muerte: Place Without Death. The original ranch house sits at the end of Plaza Sin Lucha (Place Without Fight). Note: According to Kelley Rollings, Calle Sin Celo, which translates to Street Without Zeal, was supposed to be Calle Sin Celos, which means Street Without Jealously, but the letter “s” was accidentally left of the plat map when it was recorded with Pima County. Special thanks to readers David Taylor and Dolores Duran-Cerda for suggesting these streets.